On December 19th, 2018, the Vietnam National Administration of Tourism, together with the Ministry of Culture, Sports and Tourism held a ceremony celebrating the arrival of the 15 millionth international visitor to Vietnam. The ceremony was held at Ha Long International Cruise Port, in Quang Ninh Province. Minister of Culture, Sports and Tourism Mr. Nguyen Ngoc Thien and Chairman of the People's Committee of Quang Ninh Province Mr. Nguyen Duc Long came to the port to present plenty of souvenirs, flowers, and gifts to the 15 millionth international visitor. 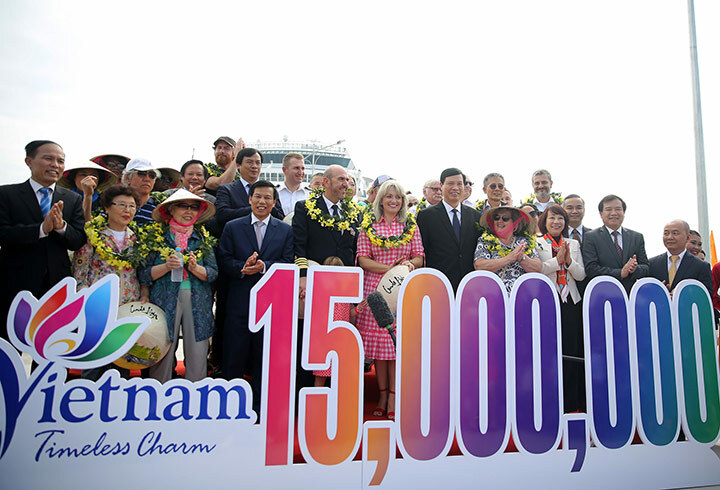 The 15 millionth visitor is American, and arrived by boat at Halong International Cruise Port at 11am, December 19th, travelling with the Celebrity Millennium Cruise, part of the Royal Caribbean cruise brand. Besides the 15 millionth international visitor, guest number 14,999,999 and 15,000,001 coming from Europe and Asia were also presented with a commemorative trophy of the tourism industry of Vietnam. These three lucky guests arrived in Halong on the same cruise having taken the following route: Singapore - Laemchabang - Phu My - Chan May - Halong to Hong Kong. According to the statistics of the Vietnam National Administration of Tourism, in the first 11 months of 2018, international visitors to Vietnam reached 14,123,556 visitors, up 21.3% over the same period in 2017. In 2018, promotional activities have led to an exciting expansion of the tourism market. The image of Vietnamese tourism is increasingly making a good impression with international travellers by way of natural wonders, beautiful landscapes, modern infrastructure, and improved service quality. Many tourism projects in Vietnam have received prestigious international awards, and in 2018, Vietnam aims to welcome 16 million international visitors. Meanwhile, Quang Ninh Province expects to welcome 5 million international visitors as part of the 12 million total visitors coming to the province. Quang Ninh Province’s total tourism revenue is estimated at around 22,000 billion Vietnamese Dong which has led to strong development of tourism in the province, including island tourism, spiritual and cultural tours, border tourism and community tourism.